"Click" a heading to expand/collapse its item. Mike Ewing was competing in the Head of the Dart on Saturday on a course of 5km. He completed the course in 21 min. 17 sec, but was awarded a penalty of 3 minutes for taking a number of short cuts. Excluding the penalty he finished 10th overall, competing with eights, quad sculls and fours, and was the fastest single sculler. Following on from Saturday's successes, our masters were competing on Sunday in the veterans' event. Overnight the wind had changed to a northeasterly direction and was considerably stronger and cooler. Conditions between Chiswick Bridge and Barnes Bridge and from Chiswick Eyot to Hammersmith were rough, while below Putney Bridge the conditions were near-sinking. The club had two Masters F crews entered and Tom Bishop was stroking a Masters H Upper Thames / Quintin composite (also with Willy Almand who was in UTRC colours). Unperturbed by the difficult conditions our top 'F' crew, starting at No. 167 passed Twickenham and Putney Town 'F' crews before Barnes Bridge and overtook a further four crews before the finish, including our other 'F' crew, the "Barflies", who started at No.159. Some solid rowing through the rough water earned them the pennant for their category in a time of 21 min. 21.47 sec, 11 seconds clear of Walton's 'F' crew and 31st overall, while the Barflies' finished 133rd in a time of 23 min. 30.70 sec. 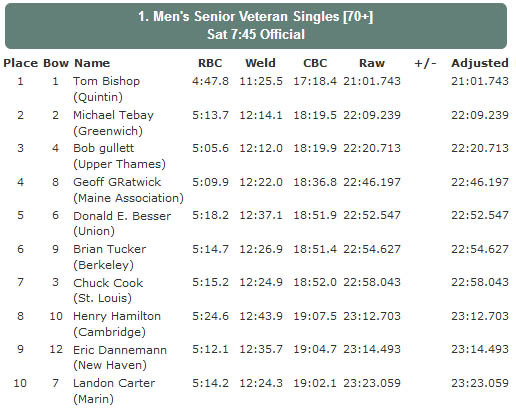 Tom's composite won the Masters H pennant, finishing 71st in a time of 22 min. 19.27 sec. Full provisional results may be found at https://docs.google.com/spreadsheets/d/1crTzhoFanMyC0YsJAquNG9VOtreh1Gs47vBFkHv-v_Y/edit#gid=0. .. and these wins must surely close this year's Pennant Winners Chart with Tom Bishop topping the chart on seven. Photographs of the event may be found at http://quintinboatclub.org/gallery/index.php?ref=2856. 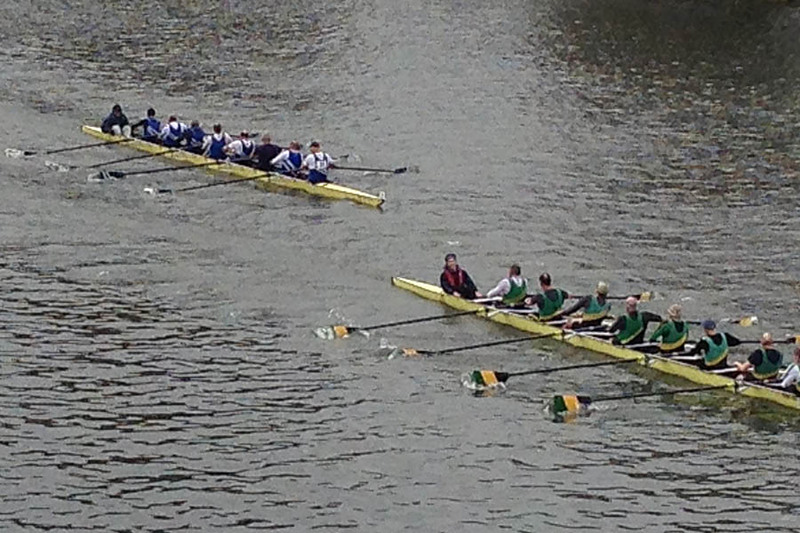 The club had three crews competing in the Head of the River Race on Saturday. In a prevailing following breeze and on a mild sunny morning some fast times were expected and Oxford Brookes delivered, winning the race in 17 min. 11.8 sec, 3.2 seconds ahead of Leander. Our fastest crew included our captain Mark Chatwin, Alex Miller, Mike Ewing, Rob Williams, Tom Solesbury and Beks Edgar and finished 30th overall in a time of 18 min. 25.3 sec. This was an excellent result for an essentially scratch crew. The faster of our senior squad crews finished a creditable 76th equal with Agecroft's B crew in a time of 19 min. 5.5 sec, while our third eight were 124th equal with Winchester College in a time of 19 min. 47.8 sec. A photograph of the event may be found at http://quintinboatclub.org/gallery/index.php?ref=2851. The club has three crews entered for the Head of the River Race this coming Saturday (30th March) and two crews for the Veterans Head of the River on Sunday (31st March), with an interest in a composite crew with Upper Thames RC. Our starting positions on Saturday are 39, 67 and 218 and on Sunday are 159 and 167 (both Masters F category) while the composite, with Tom Bishop onboard, is in the Masters H category at number 179. Saturday's race is scheduled to start at 11:30 GMT. The full starting order may be found at http://www.horr.co.uk/wordpress/draw/. We switch to British Summer Time on Sunday morning and the veterans' race starts at 13:30 BST. The starting iorder is available at https://www.vestarowing.co.uk/veterans-head-of-the-river/. 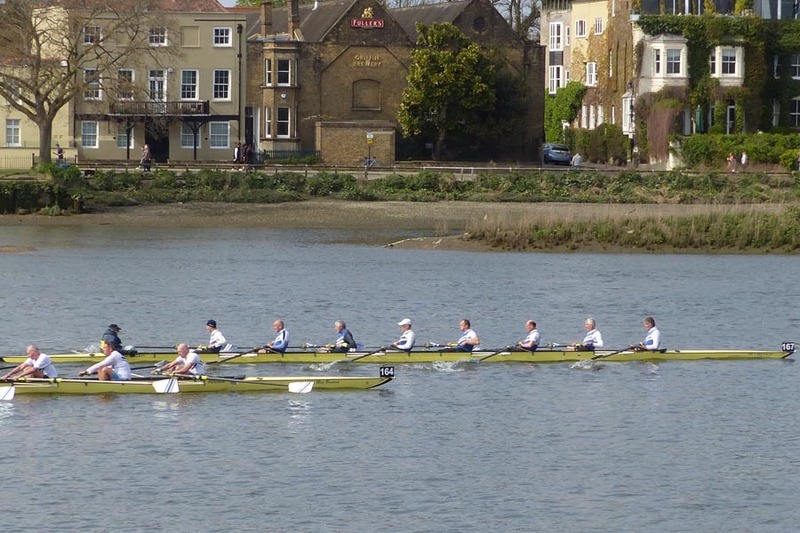 The club had two masters eights racing at the Kingston Head on Saturday. The so-called "barflies", racing in the 'F' category started at number 29 in division 1, with the so-called "supervets" in the G/H handicap category two places behind at number 31. The G/H crew had a fine race, overtaking the Barflies just before Raven's Ait. Their time of 18 min. 30 sec. not only won them the G/H handicap pennant but also beat all the Masters 'F' crews and all but one of the 'E' crews. The Barflies came home in 20 min. 4sec, over half a minute ahead of the Maidenhead RC 'E' crew. The names of the members of the winning crew may be found at ../results/wins.php?ref=2019-03-23. Full provisional results may be found at https://www.kingstonrc.co.uk/kingston-horr. Photographs of the event may be found at http://quintinboatclub.org/gallery/index.php?ref=2847. The club has two crews entered for Kingston Head of the River on Saturday - a Masters F eight and a Masters G eight. 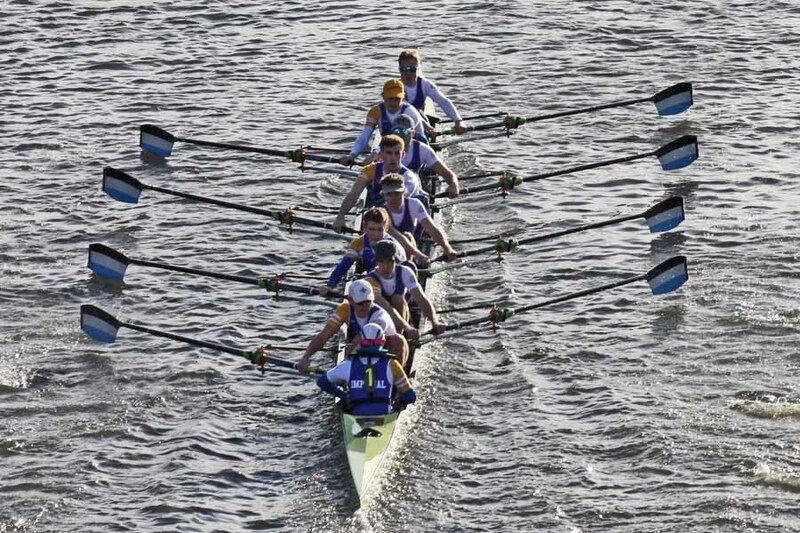 The 'F' eight has Star CLub, Walton, Twickenham, Walbrook and Galway Rowing Club as opposition while the 'G' eight is in a merged G/H category along with Broxbourne and Weybridge. Both crews are in Division 1, which is scheduled to commence at 11:00 am, the 'F' crew starting at number 29 and the 'G' cew at number 31. The full starting order may be found at https://docs.wixstatic.com/ugd/73456b_d8be635022804bf5889405e24fb2fc54.pdf. The Women's Eights Head of the River Race was cancelled due to high winds. Quintin has more than a passing interest in the Women's Head this Saturday. Lorna Cardwell will be representing the club in a Masters B eight composite with Tideway Scullers. Their starting position is 70 and the race is scheduled to commence at 11:30 am. There is some concern being expressed by the organisers regarding the high winds currently prevalent. Details of any changes to the race plan will be posted on the Women's Head website. The club had three crews entered in Hammersmith Head on Saturday, with an interest in a further two composite crews. On a mild but blustery March afternoon the sun shone through the clouds for the duration of the race and a strong SW wind suggested some fast times were expected. Shiplake College were the fastest eight in a time of 10 min. 31.1 sec. Our1st VIII, classified in the Open Championship category finished 13th overall in a time of 10 min. 53.7 sec. The 2nd VIII, in the Open Club category were 40th overall in a time of 11 min. 15.4 sec. Our Masters F crew were the fastest in their age group but missed out the Masters F/H pennant to the Quintin / Upper Thames composite Masters H crew based on a handicap of some 43 seconds. Our crew completed the course in 11 min. 46.7 sec. while the composite clocked 11 min. 57.8 sec. Tom Bishop represented Quintin in the composite while Willy Almand was in UTRC colours. Lorna Cardwell represented Quintin in the composite women's Masters B VIII with Tideway Scullers, a crew which won the women's Masters B/C category in a time of 12 min. 21.1 sec. So Lorna and Tom are credited with wins in our 2018-19 Pennant Winners Chart and Tom pulls clear with five wins to date. Full provisional results may be downloaded at https://www.hammersmithhead.com/results. 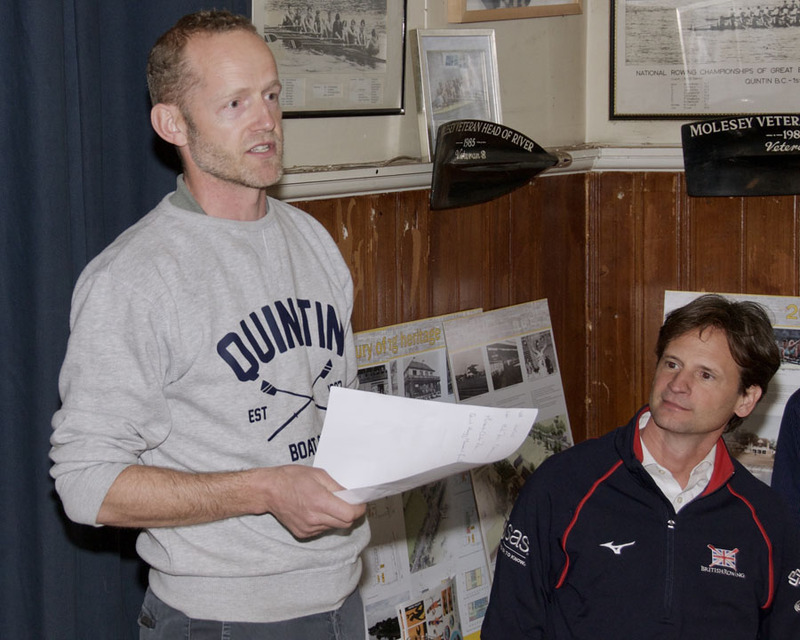 The prizegiving for the Quintin Head was held on the evening of Thursday 28th February in the club room at the boathouse. Prizes were presented by Mark Davies and about 100 people attended the ceremonies. Medals were awarded to all category winners and there were also prizes of cases of beer, supplied by Marston's Brewery, for the fastest non-academic open and women's crews. Both were won by Thames Rowing Club. The race committee also instigated junior victor ludorum prizes this year, for the fastest aggregate times in the 15, 16 and 18 years old age groups for both boys and girls. The prizes of CoxOrb Platinum kits were donated by the Quintin Hogg Memorial Fund. The boys' prize was won by Westminster School and the girls' prize by Marlow Rowing Club. The winners of all the prizes, their times and finishing positions may be found at ../quintinhead/results.php?date=2019-01-27. Photographs of the event may be found at http://quintinboatclub.org/gallery/index.php?ref=2829. The 16th Quintin Head took place on a cold and windy but sunny morning of Sunday, 27th January 2019, the first crew crossing the start line pretty much at the scheduled time of 10:00 am. There were over 250 entries received, but inevitably there were some scratchings and also some crews not turning up on the day. Rumour had it that Molesey's Open Championship crew were very fast but, as things turned out they were ultimately disqualified due to an administrative error in the naming of their crew. Imperial College's Open Championship crew were declared overall winners and also won the Open Championship category while Cambridge University Women's Boat Club similarly were the fastest women and won the Women's Championship category. Two new prizes this year were the Quintin Hogg Memorial Prizes, one for junior men and one for junior women. These were to be awarded to the clubs that recorded the lowest aggregate times for J18, J16 and J15 (and the women's equivalents). This year the prizes were CoxOrb Platinum devices and the winners were Westminster School for junior men and Marlow Rowing Club for junior women. Quintin entered two crews: one which fell into the Senior category, and the other a Masters G and slightly more senior crew, at least in age. The Senior crew finished 34th overall in a time of 12 min. 54.0 sec. while the Masters managed to get themselves disqualified (something to do with foul language). Most of the rest of the club's active members were busy carrying out the myriad jobs required to run such an event. Our many thanks to them and to the race officials. Full results on the Quintin Head Results Page. Photographs of the event may be found at http://quintinboatclub.org/gallery/index.php?ref=2820. This year's Quintin Head is once again fully subscribed, with 250 accepted entries. Once again Cambridge University have entered women's crews (three this year) and Oxford University Lightweights have entered two open crews. Vesta Rowing Club have entered a cracking ten crews, with further interest in a composite with Twickenham. On the junior front there are six teams competing for the Quntin Hogg Memorial Prize for boys: King's College School, Wimbledon, Norwich School, Reading Blue Coat School, St. George's College, St. Paul's School and Westminster School. The Quintin Hogg Memorial Prize for girls has three contenders: Lady Eleanor Holles School, Marlow Rowing Club and Putney High School. With most of its members helping to run the race, Quintin has just two entries: an Open Senior eight and, in a composite with Kingston RC, a Masters G eight. They start with bow numbers 28 and 159 respectively. The race begins at 10:00 am on Sunday and the full starting order may be found at ../quintinhead/startorder.php. As a precursor to our traditional Christmas party, our traditional "plum puddings" race was held over the usual course today from the Pink House to the club, with a scheduled start time of 11;15 am. As well as five eights from Quintin, a number of other clubs were invited to compete, producing a field of sixteen crews. The format was to start crews in an approximate estimated order of speed to keep overtaking to a minimum and after the time trial was over award prizes based on a sealed handicap. The results are given below. So Oxford University Lightwieghts A were awarded the first prize of nine bottles of wine, Quintin Seniors B the second prize of nine Christmas puddings (actually ten as they came i a pack of ten) and third prize went to Mortlake Anglian and Alpha's mixed Masters F eight in the form of a case of small bottles of lager (locally known as "bozos"). Then the festivities began. Thanks to the Quintin Hogg Memorial Fund (Quintin Boat Club's landlord) at the 2019 Quintin Head there will be two junior victor ludorum prizes of a CoxOrb Platinum – one for boys and one for girls. For each gender the prize will go to the school or club with the fastest total time for its J18, J16 & J15 crews. If a school or club has more than one crew in an age group the time of its fastest crew will count. Crews that enter as senior even though their age would allow them to enter as junior will not count. The prize will not be awarded if only one school or club has crews in all three age groups. For entry details see our Quintin Head page. Walton Small Boats Head has been cancelled in the expectation of the forecast high winds. All entry fees will be refunded. The club has an interest in 14 entries for Walton Small Boats Head next Saturday: eight in division 1, starting at 10:00 am; five in division 2, starting at 12:00 noon and one in division 3, starting at 2:00 pm. The entries are all-QBC except for Beks Edgar's composite with Emily Walters of TSS. The starting positions are given below. The full start order for each division may be found at http://www.waltonrowingclub.co.uk/wp-content/uploads/2018/12/WSBH-Start-Order-2018.pdf. Tomorrow's race has been cancelled, based on the forecast direction and speed of the wind for tomorrow morning together with the strong likelihood of rain. Leif Jacobsen has just returned from a visit to the west country to team up with his old Quintin crew buddy Tony Hynes in a Masters E coxless pair for Evesham Rowing Club's Avon Masters and Senior Head. This race is, unsurprisingly, rowed on the River Avon at Evesham over a distance of approximately 4000m. Leif and Tony rowed as a composite Quintin / Cotswold RC crew and we are pleased to report that they won their category. They completed the course in 18 min. 17 sec, a whole minute and 17 seconds ahead of the Warwick Boat Club Masters E pair in second place. Leif joins our illustrious band of 2018-19 pennant winners. The full starting order may be downloaded from https://drive.google.com/file/d/1I-dBNlPygmfPCFuAisKfqpmuGWETy8uc/view. Charles Harrison won a Masters F single sculls pennant for the second week running today at Teddington Small Boats Head. Charles completed the course from Hampton Court to Steven's Eyot in Kingston in a time of 23 min. 39.1 sec, more than 35 seconds ahead of his closest rival. Mike Ewing, who was also entered for the race in Open single sculls, scratched. The full results may be downloaded from http://www.walbrookrc.co.uk/teddington-head. Charles moves into equal second place in this year's Pennant Winners Chart. In all the anticipation leading up to the disappointment of the cancelled Turin Silver Skiff last weekend, we failed to mention that Charles Harrison was competing in the Henley Sculls Head last Saturday. Charles was the fastest Masters F single sculler, in a time of 15 min. 19 sec, 33 seconds faster than his closest rival. This win moves Charles up into equal third place in this year's Pennant Winners Chart. Charles is also competing in the Teddington Small Boats Head tomorrow. He has again entered for Masters F single sculls and starts at number 121 in division 1 (which commences at 10:30 am). 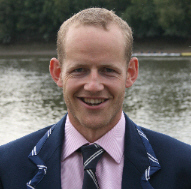 Mike Ewing is also entered for Teddington, in Division 2 open single sculls. Division 2 starts at 2:00 pm and Mike will be wearing bib number 254. The full starting order for each division may be downloaded from http://www.walbrookrc.co.uk/teddington-head/competitorsinformation. We have been given the sad news of the death of Brian Alldridge who died on Sunday, 11th November after a short illness. Brian was captain of Quintin in 1963 and 1964 and rowed for us at Henley from 1959 to 1962. 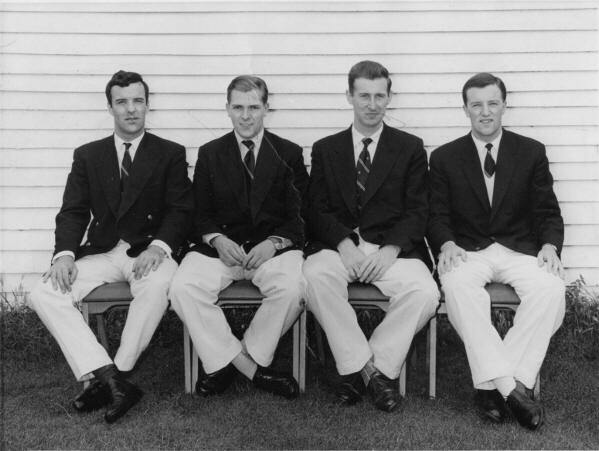 In the photograph above, Brian is with his colleagues Norman Webster, Brian Welch and Bob Slade from our 1960 Wyfold four. His cremation will be at Mortlake Crematorium at 12:40 pm on Monday 26 November. A photograph of Brian in the 1960 Senior coxless four may be found at http://quintinboatclub.org/gallery/index.php?ref=113. 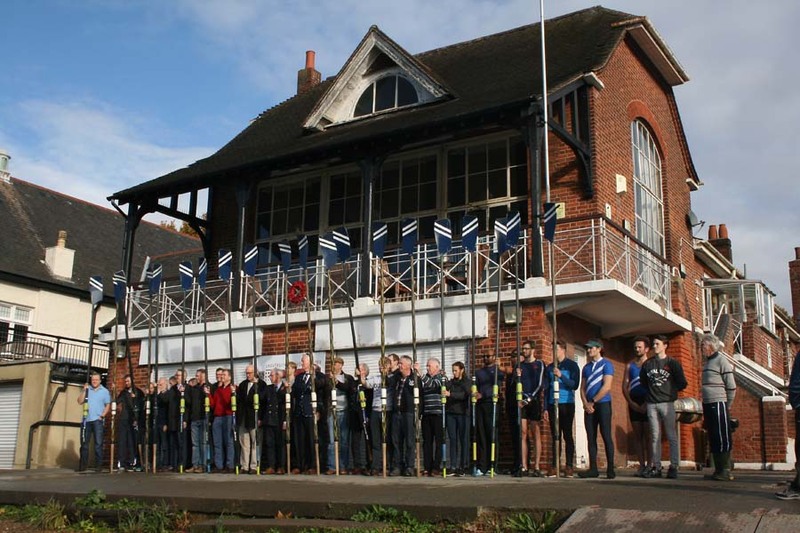 Following the suggestion from British Rowing, Mortlake Anglian Boat Club and Quintin Boat Club (among others we hope) upheld the two minutes silence at 11 o'clock this morning whilst displaying in front of their boathouses one oar for each of their members who lost his life in either of the two world wars. Quintin's act of remembrance on this 100th anniversary of the 1918 armistice consisted of twenty oars held by current members of the club. Photographs of the ceremony may be found at http://quintinboatclub.org/gallery/index.php?ref=2809. Sadly the Turin Silver Skiff race has had to be cancelled, due to the strong currents resulting from the recent heavy rainfall in northern Italy. Let us hope that our competitors were able to put their trip to Turin to other uses. The club has three entries for the Turin Silver Skiff, which takes place on the River Po in Turin next Sunday. The race is a time trial over 11 kilometres on an out-and-back course with a turn around a buoy at the halfway mark. Our scullers are: Tom Bishop (Masters H), starting at number 114; Mark O'Brien (Masters D), starting at number 121 and Pete Meaney (Masters F) at number 201.We wish them each a pleasant trip and a good scull. The race is scheduled to begin at 9:30 am local time. The full starting order may be found at https://www.silverskiff.org/en/silverskiff-griglia-partenza/. The club had an interest in six crews for the Veteran Fours Head on Sunday - three all-Quintin crews and three composites. Alex Miller, sculling in a Star Club / Peterborough City / Leicester / Quintin composite Masters B quad, finished second overall and the fastest in category, adding to his win in Championship coxed fours the previous day. Tom Bishop's composite Masters G quad (Dart Totnes / Quintin / Wallingford) also won their category, as did the all-Quintin Masters G coxless four. Beks Edgar's composite with MAABC and TSS were the only Women's Masters A quad, but were beaten to the fastest women's slot by the Upper Thames WMas B crew. For the pennant winning personnel, see our Head and Regatta Wins page. 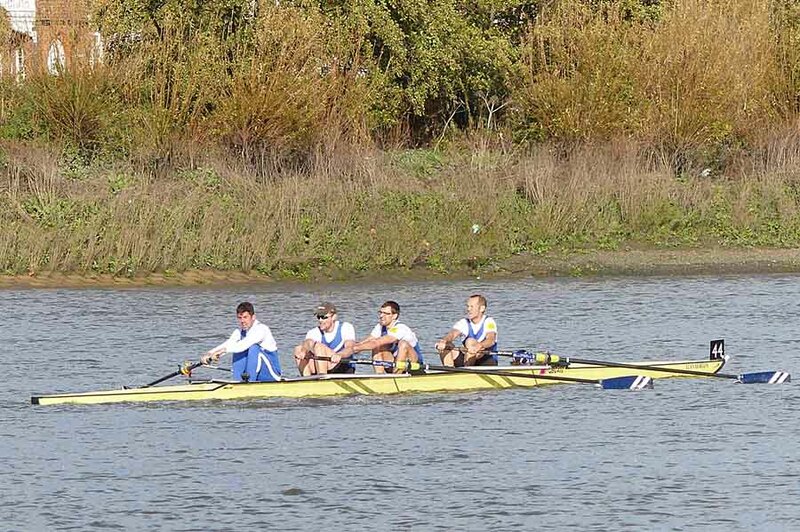 The club had four crews racing in the Fours Head on Saturday. On a mild November day, but with a blustery southerly wind to contend with, particularly beyond Harrods, our Championship coxed four won their category in a time of 20 min. 7.6 sec, 11 seconds clear of Kingston RC in second place. They were the eighth coxed four overall, behind crews from Isis, Goldie, Imperial College and St. Paul's School. For the line-up of the winning crew, see our Head and Regatta Wins page. We also had crews competing in the Coxed Fours Challenge, Coxless Fours Challenge and Coxless Fours Intermediate categories (whatever they may imply). Our crews' results are summarised below. We await publication of the final results for the positions overall. A photograph of the winning coxed four may be found at http://quintinboatclub.org/gallery/index.php?ref=2807. Our secretary has now ascertained that both Charles Harrison and Tom Bishop won pennants at Wallingford Long Distance Sculls on 29th September. Charles won the Masters E/F handicap and Tom won the Masters G/H/I handicap. This extra win for Tom places him firmly at the head of this year's Pennant Winners Chart. The full starting order (pdf format) may be downloaded at https://hor4s.files.wordpress.com/2018/10/startorderhor4s2018rep29.pdf. The full starting order for the veterans' race (Excel format) may be downloaded from http://vet4shead.squarespace.com/. The full results may be found at https://herenow.com/results/#/races/20514/results (Saturday tab) or https://www.regattacentral.com/regatta/results2/eventResults.jsp?job_id=5656&event_id=1. And, as is his wont, Tom leads this year's Pennant Winners Chart. Below is an updated report on the results of the Pairs Head. The organisers have had some difficulty with the timings - but the final results are now published (10th October). Our sympathies are with them - with over 450 crews it's a lot to get right. The Pairs Head took place on Saturday on the coldest, wettest day for some time. Ironically the next day the skies were blue and the river as calm as a millpond (coaching launch washes excepted), but on the day the northerly wind gave challenging conditions from Barnes Bridge to Chiswick Eyot and it rained all afternoon. The race kicked off more or less on the scheduled start time of 3:00 pm and it is believed that most crews reached their disembarkation areas before dark. From the eight crews containing club members, Quintin chalked up five pennant wins and two second places. Particularly outstanding was the win in Masters B double sculls by our captain, Mark Chatwin and his partner Tom Solesbury, who not only won their category pennant but finished second overall, just 0.4 seconds off being Head of the River. Also outstanding were Alex Miller and Mike Ewing in winning the Senior coxless pairs pennant, finishing tenth overall and the second fastest coxless pair. Congratulations also to Beks Edgar and Lorna Cardwell, who completed our double in Masters double sculls by winning the women's divison, and to Steve Aquilina and Ian Hyslop for their win in Masters F doubles. Our results are summarised below. A complete list of results is available at https://docs.google.com/spreadsheets/d/1EsKDXBB8xYkBgjV7TaJcN0usAuJHSNkYeNOt5CHDrUg/edit#gid=0. This year's Pennant Winners Chart is truly up and running. 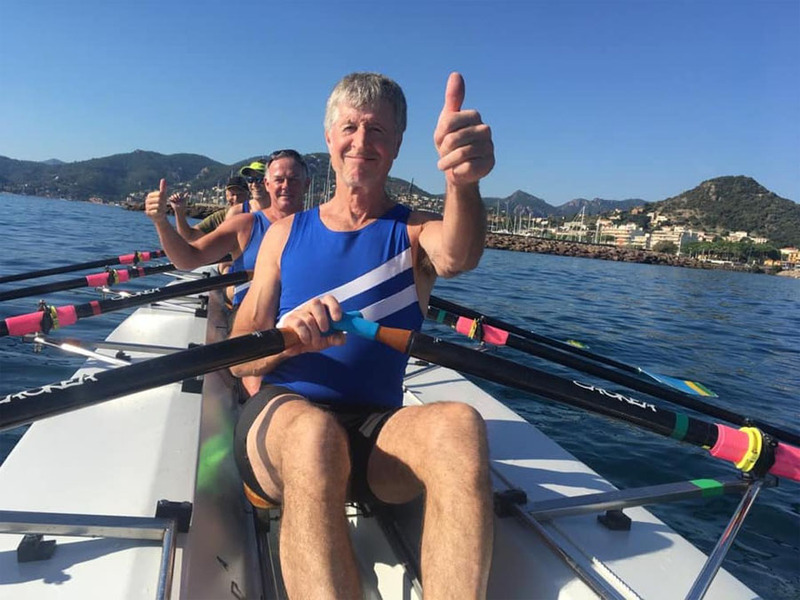 "On Saturday 29th September, Ian Stephenson, Huw Jones and Richard Lonergan took part in a coxed quad row along the western end of the Nice/Cannes Bay. The crew was coxed by Theo (a Mandelieu la Napoule club stalwart) with local 'Niall Bates' sitting at 2. The crew quickly found their sea legs and were therefore able to efficiently see off the local teenage girls and boys crews, ...result! However, a shoal of 'flying' herrings possibly had the edge on us. "Note: The clubs' island race/rowing festival around Iles de St Honorat (~20km) is this coming weekend 6/7th October. Something for a QBC entry next year perhaps? www.rccannesmandelieu.com. "Along the coast, the 'Club Nautique de Nice' http://www.cnnice.fr/ also proved to be an amazing spot for swimming, sunbathing, watching the stunning ships sail by and eating incredibly delicious food (or 'rooopas' as Richard would have it)." Photographs of the crew may be found at http://quintinboatclub.org/gallery/index.php?ref=2803. As happened last year, it was a pleasant, sunny morning for this year's club sculling championship and sculling handicap race, which got underway not too long after the scheduled start time of 10:15 am. Mike Ewing led off the procession and increased his advantage to win the overall title of club sculling champion, in a time of 16 min. 56 sec. Mark Chatwin returned to competition and form, coming second a mere 20 seconds behind Mike, followed by Alex Miller in third place, a further 29 seconds behind. Mark O'Brien, finishing fourth, was the fastest in the Masters D-E category and received a bottle of wine for his troubles. Tom Bishop was fifth and the fastest Masters F+, for which he also won a bottle of wine. Steve Aquilina was sixth overall and won the sealed handicap race for the Finlayson Cup. The handicapping placed the six fastest times on handicap all within ten seconds of each other, so congratulations to the handicappers on that score. Full results may be found at ../sculling/results.php?ref=2018. The club's Annual General Meeting took place at midday. Full minutes will be published in due course. Bill Burbage retired as treasurer, having held the post for 21 years. Mark Chatwin presented him with a soon-to-be-illuminated blade as a memento and he was given a hefty round of applause and a vote of thanks from the floor. To honour his long-standing service to the club he was elected a vice-president. On a bright sunny autumn morning Charles Harrison and Tom Bishop took to the waters of the upper Thames today to compete in the Wallingford Long Distance Sculls on an upstream course of some 4,250 metres. Charles was the faster of the two Masters F single scullers, beating Fricker of Maidenhead RC by 47 seconds in a time of 19 min. 14.9 sec, which was faster than all the Masters E single scullers. Tom was the faster of the two Masters H singles entries, beating his doubles partner from Wallingford RC, Charles Parry, by 67.5 seconds in a time of 19 min. 11.8 sec. This made him faster than all of Masters B, E, F and G and also half of the Masters D field. Pennant winners for masters events were not announced on the event website, but it has been ascertained that Charles won Masters E/F and Tom won Masters G/H/I. The club has an interest in eight entries for the Pairs Head at the end of next week - six all Quintin crews and two composites with MAABC. The start positions and categories for our crews are given below. There are 471 entries altogether. The race begins at 3:00 pm. The full starting order may be found at https://www.bblrc.co.uk/wp-content/uploads/2018/09/2018_Start_Order_v2.1.pdf. We have two entries for the Wallingford Long Distance Sculls on Saturday - Charles Harrison starts at number 248, competing in the Masters F single sculls category and Tom Bishop satrts at 274, competing in Masters H. Both scullers are in division1, which commences at 11:00 am. The full starting order may be found at https://wallingford-sculls.org.uk/draw/.